Do you find yourself in full-on homework battles most nights of the week? It’s no surprise that most children and teens will dig in their heels when it comes to doing schoolwork. Think of it this way: How many kids want to do something that isn’t particularly exciting or pleasant? Most would prefer to be playing video games, riding their bikes or driving around with friends, especially after a long day of school and activities. As long as you believe you are accountable (or to blame) for your child’s outcome, you are under her control. The underlying truth here is that you and your child might already be caught in a power struggle over this. Like most parents, you probably want your children to do well and be responsible. Maybe you worry about your child’s future. After all, doing homework and chores are your child’s prime responsibilities, right? 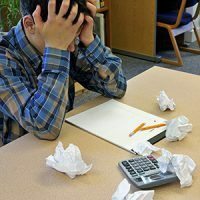 Let’s face it, it’s easy to get anxious when your kids are not doing what they’re supposed to be doing—and when you know how important doing schoolwork is. And when you believe you are ultimately responsible for the choices your child makes (and many of us do, consciously and unconsciously), the ante is upped and the tug of war begins. If you’re in the habit of threatening, lecturing, questioning your child, nagging or even screaming at them “do the work!” (and trust me, we’ve all been there), you probably feel like you’re doing whatever it takes to get your kids on track. But when you’re in your child’s head, there’s no room for him to think for himself. And unfortunately, the more anxious you are, the more you’ll hold on in an attempt to control him and push him toward the task at hand. What happens then? Your child will resist by pushing back. That’s when the power struggle ensues. Your child, in essence, is saying, “I own my own life—stay out!” Now the battle for autonomy is getting played out around homework and chores, and exactly what you feared and hoped to avoid gets created. This is very aggravating for parents to say the least. Many of us get trapped into thinking we are responsible for our child’s choices in life. As long as you believe you are accountable (or to blame) for your child’s outcome, you are under their control. This is because you will need your child to make those good choices—do the work—so you will feel that you’re doing a good job. Your child’s behavior becomes a reflection of you. You are now at your child’s mercy as you trying to get him to do what you want him to do so you can feel validated as a good parent. Your child does not want to be taking care of your emotional well-being, so he will naturally resist. When kids are not following through on their responsibilities, it can easily trigger a number of feelings in parents. Note that your child did not cause these feelings, but rather triggered feelings that already belong to you. You might be triggered by a feeling of anger because you feel ineffective or fear that your child will never amount to anything. Or you might feel guilt about not doing a good enough job as a parent. Here’s the truth: You have to be careful not to let these triggered feelings cause you to push your kids harder so that you can feel better. One of the toughest things parents have to do is learn how to soothe their own difficult feelings rather than ask their children to do that for them. This is the first step in avoiding power struggles. Why are power struggles important to avoid? They inadvertently create just what you’ve feared. Your child is living his life in reaction to you rather than making his own independent choices. Learning how to make those choices is a necessary skill that develops self-motivation. How can you avoid ending up in these battles? Here are 7 tips that can really help. Understand that you are not responsible for the choices your child makes in his life. It’s impossible to take on that burden without a battle for control over another human being. Measure your success as a parent by how you behave—not by what your child chooses to do or not do. Doing a good job as a parent means that you have done all that you can do as a responsible person. It does not mean that you have raised a perfect person who has made all the right choices. Once you really get this, you won’t be so anxious about your child’s behaviors, actions, and decisions. You will be able to see your child from objective, not subjective, lenses and therefore be able to guide their behavior, because you’ll have seen what he actually needs. You cannot get a person to do or care about what they don’t want to do or care about. Our kids have their own genetics, roles, and ultimately their own free will. So focusing on getting your child to change or getting something from her will not work long-term and will most often turn into a power struggle. What you can do is try to influence your child using only what is in your own hands. For example, when it comes to homework, you can structure the environment to create the greatest probability that the work will get done. Take charge of your own best thinking and decisions rather than trying to control your child’s. Pause, think and decide what fences you want to create for your child. What are your bottom lines? Know what you can and can’t do as a parent. Recognize that what will make the biggest difference to your child (and helping him become a responsible kid who makes good choices) will be learning how to inspire him, not control him. Building a positive relationship with your kids is your best parenting strategy. Children want to please the people in their lives that they have loving feelings toward. You cannot ultimately make them accept your values, but you can inspire them to do so. Getting a child to listen to you is primarily about setting up the conditions under which they choose to do so. In order to do this, make a conscious effort to sprinkle your relationship with more positive interactions than negative ones. Hug, show affection, laugh together, and spend time with one another. Point out your appreciations most instead of constantly correcting, instructing, teaching, yelling, complaining, or reprimanding. Don’t get me wrong, you need to correct and reprimand as a parent. But make a conscious effort so that every time you do this, you will follow it with many positive interactions. The human brain remembers the negatives much more than the positives. Most kids will be happy to listen and be guided by the people in their lives who they like and respect. 4. Should you give consequences when kids don’t do homework? Parents always ask whether or not they should give consequences to kids if they don’t do their homework—or instead just let the chips fall where they may. I think you can give consequences, and that might work temporarily—maybe even for a while. Perhaps your child will learn to be more responsible or to use anxiety about the consequences to motivate themselves. You can’t change someone else, but consequences might help them get some homework done. You can’t “program” your child to care about their work, but you can create a work environment that promotes a good work ethic. Kids who regularly get their homework done and study do better throughout school and overall in life. Again, you can’t make a child do anything that he doesn’t feel like doing, but you can structure his environment to create the greatest probability that the work will get done. When your child’s grades slip, or you find that he’s not getting his work in on time, you are automatically “invited in” to supervise and help him get on track. You can make sure that for certain periods of time, he will not be able to do anything other than schoolwork. The rule is during that time, no electronics are allowed—just homework and studying. By doing this, you are providing a structure to do what your child probably can’t do yet for himself. The hour and a half that you set aside should be a time when you will be around to enforce the rules that you have set. Give a fixed amount of time and once that time is up, your child is free to go elsewhere, homework done or not. Stay consistent with this plan, even if he fights you on it. This plan will accomplish the possibility that your child will get some homework done and maybe over time, create some better work habits. That’s all. This plan should be in place, whether or not he has homework. He can read, review or study if he doesn’t have any during that time. Let him know that these rules will change when his grades begin to reflect his potential and when you are not getting negative reports from teachers about missing homework. When he accomplishes this, tell him you will be happy to have him be fully in charge of his own homework. Extremely defiant kids who don’t seem to care about consequences really try their parents. Some of these kids suffer from ADHD, ODD, learning disabilities, emotional issues and many other issues. Defiance has become a way for them to try and solve their problems. With defiant kids, parents need to be very cognizant of working to develop positive relationships, no matter how difficult. Above all, work to avoid getting pulled into a power struggle. Your child will need many more learning opportunities and more rewards and negative consequences—and more time to learn these lessons than less defiant child. And if nothing changes, and your child continues to be defiant, you must continue to work on your own patience and be thoughtful about your own bottom line. Most important, continue to love your child and keep showing up. Be clear, concise and direct. Your simple message to your kids, which does not require lectures or big sit down conversations is, “Your job is to take care of your responsibilities, which includes getting your homework done and helping out in the house. That’s my expectation for you. Once you’ve done that each day, you are welcome to do what you’d like.” Remember, as a parent your job is to essentially help your child do her job.